My son is obsessed with campers. He points them out on the road, gawking at them, and often draws them, narrating their parts in great detail for whoever will listen. He says he likes the idea of being able to take everything you need with you wherever you go. And I agree with him: in a time when the size of the average U.S. home has practically doubled since the 1950s, standing at around 2,400 feet, it's sort of refreshing to think about living with just what you need. A few weeks ago, I showed him pictures and a video about the Tiny House Movement, and it definitely made an impression; he's still talking about it. The Tiny House Movement itself is nothing new, really, but it caught the public's attention back in 2006 when Dee Williams got herself featured in Time Magazine. Her 84 square foot house on wheels has a composting toilet, no shower, and space for only 300 items. It costs her $8 per month to live there, for heating. Tiny Houses aren't for everyone. You can't really, for example, have a family in a house that's 84 square feet, at least not unless the weather is pretty good year round. We can't all live in someone else's back yard. But I do like what Williams says about living intentionally. I suspect at some point you start to realize just what that old saying means, that good things come in small packages. I don't have a Tiny House. I will probably never have a Tiny House. And that's OK with me. In fact, I just bought something entirely frivolous that will eat up space in my kitchen cabinet, with a gift certificate that has been burning a hole in my pocket since I baked cakes for our friends' wedding last summer (thank you, M and H!). Said new kitchen item would never come with me if I had to downsize, and it would not be among the things I'd put in my son's camper. BUT ... tasting the first ice cream from our new ice cream maker reminded me that I didn't need to eat an entire pint in order to appreciate the treat, that good things often do come in small packages. Or, in this case, bowls. See those specks? That's real vanilla bean, folks. Jeni Britton Bauer is an artisan ice cream maker in Ohio. Her ice cream cookbook, which I covet, debuted last summer, and I confess I checked it out of the library and salivated over the possibilities when S. was on his last business trip and couldn't talk me out of my madness. This is her vanilla take on her foolproof standard base. I am pretty sure that you could use less sugar, with equally good results, but haven't yet been brave enough to try. Strain the ice cream base into an ice cream maker and freeze according to the manufacturer's instructions. Pack the ice cream into a plastic container. I hadn't heard of the Tiny House Movement. That's fascinating. As someone who saves way too much, I really appreciate those who try and are successful living with less. How cool that you got an ice cream maker! Yummy! We paid $8 earlier this year for a small container of homemade strawberry ice cream at the farmer's market. It was pricey, but delicious. My two favorite things that recently came into my life in small packages are my new baby nephew (who I got to meet in person and hold for the first time today) and the MacBook Pro that we bought today (with 18 month 0% financing)! We are a big fan of 0% financing, as we get to spread out paying things off while we enjoy them and always make sure we pay them off in time. I find the tiny house movement in the States intriguing - in Malawi it's the norm as many are still living in mud brick homes with thatched roofs and even those with brick walls and tin roofs tend to be about the same size as the traditional houses. However those who have tend to have a lot in this part of the world and the disparity is really obvious when you look at home size. We don't have a tiny house but we do have a small house - two bedroom, open plan kitchen & lounge - no attic, no basement and during the hot months it gets too hot in the kids' room for them to sleep there so all four of us move into our bedroom that has air conditioning. It is feeling too small for us at the moment especially since the kids can't run freely outside because of the danger of wildlife. We definitely have some cabin fever over here! Having a small place means I definitely don't hold onto things. As soon as something is outgrown it is passed on and if something is not used regularly it goes. Even with a small place I have considered getting an ice cream maker - what a treat! Last week we froze banana and then put them in the blender. I didn't add anything else but I put them in ice cream cones and told the kids it was ice cream. My oldest loved it but my youngest wasn't sold. Yours looks so much better. I love homemade ice cream. My grandparents used to make peach ice cream with the most amazing peaches in the world. I recommend it if you have any decent peaches around. I'm very intrigued by the chili cinnamon! I fell in love with a sweet potato ice cream we had in a restaurant at the beach a few years ago and tried to recreate it. It was pretty good, but it needed more sugar. We lived in an 1800 sqf house a few years ago that felt tiny to me for some reason, and I started reading "The Not-So-Little Little House" to figure out how to "cope." I always want more space for some reason. I think our house is a perfect size for us. 1,400 square feet. I wouldn't want anything bigger. 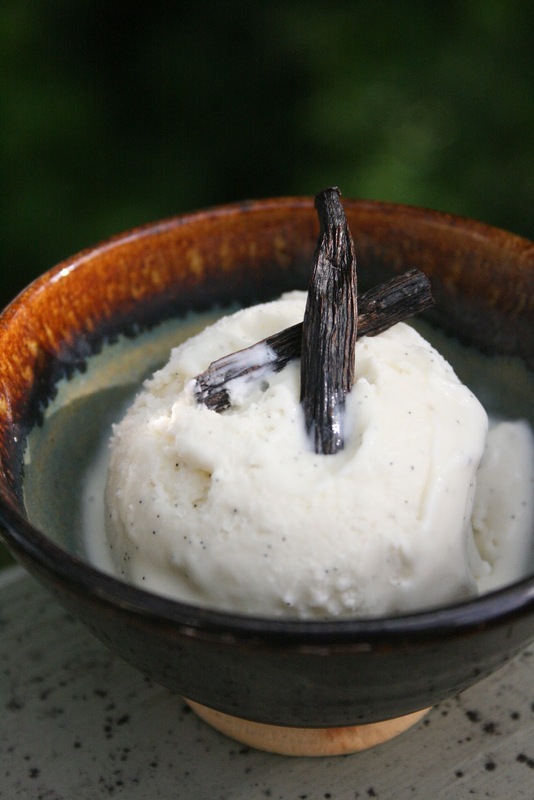 I love the sound of cardamom ice cream! I love cardamom!